number 3 and number 56 around 3-4 months apart in the limited custom production run. plan shape is almost the same with a very slight blunter nose profile, but! the rail thickness made me shout out loud when I turned both boards edge on to compare. number 3 board has a rail edge thickness of 13mm when measured in line above the red M on the base. the Number 56 board measured 29mm at the same point. The much thicker edge now looks more like the edge of my groove skate I sold a few weeks ago. gone is the very slender edge profile. Is this due to responding to team feedback before a 2019 standard production 128 mast tracked pocket board I wonder. 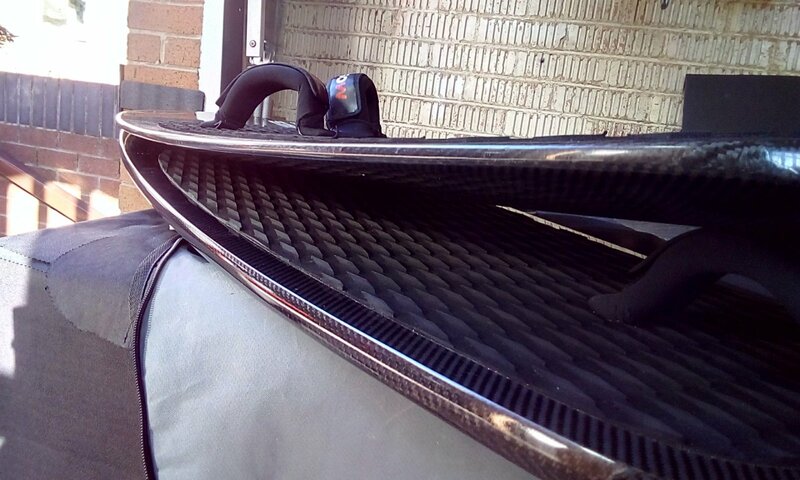 as for owning 2 different Moses 128 ltd edition full carbon boards, I am happy, as they will offer a slightly different feel due to the increased rail volume and extra stiffness, well so I believe they will feel different, they do look so different when viewed from the side. ( I am using the higher volume number 56 board later today. 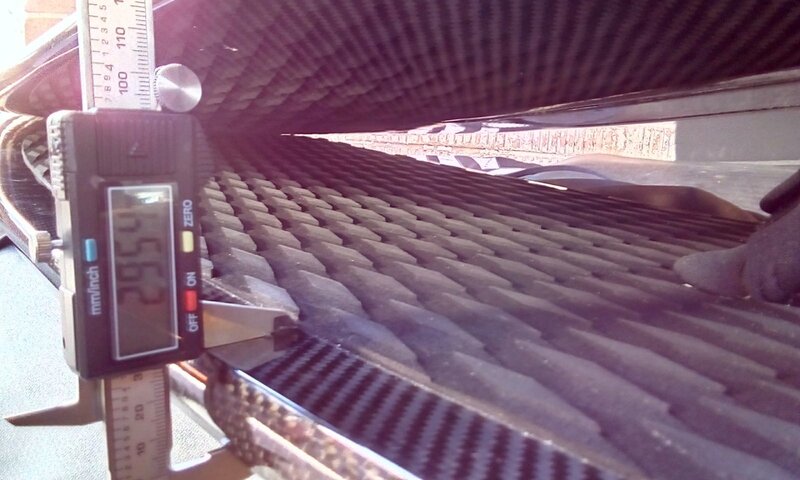 Is there some concave on the deck of your t38s? 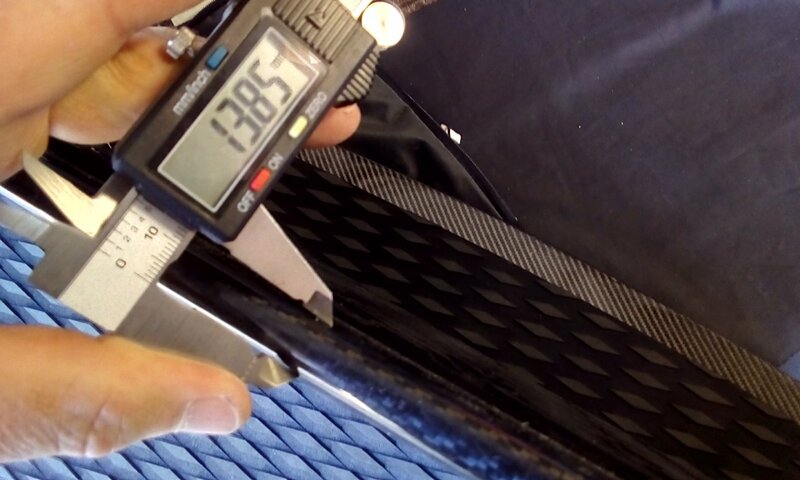 I think the core is very soft.. and maybe not enough layers of carbon. It is definitely VERY delicate and dings very easily. mind you I do look after my stuff, and after your past the beginner stage you tend to stop being dragged around in a rocky shore break, or constantly hitting the bottom trying to get up, and I probably have one of the best set ups for transporting my kit around and attaching wings when I get there. its certainly no less fragile than my previous Moses T60 carbon boards and is more scratch resistant than my X Groove skate which scratches up far too easily around the edges. That looks like the Moses comet race board full carbon, But only understanding English I could not understand what he was explaining,the blown surface of the board looks terminal for using as a race board, it looks like water has got in around the mast tracks. Before use, place the board on the water and wait a minute before tightening up the air valve. Don't leave the board in the back of a car in very hot climate with a closed valve. Maybe a valve might be a good idea on the thicker carbon boards. I was told by a pro board builder that open cell foam is often used in mega lightweight board construction, and that absorbs water like a sponge. closed cell foam resists water. but I know nothing about that subject.